Salmon and Mackerel-has the balance been tipped??? 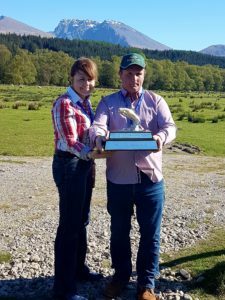 River Lochy Spring 2018 – what can we expect? As Spring 2018 fast approaches, how will it shape up?? Well, without my crystal ball it’s extremely hard to predict with any degree of certainty……there’s just too many variables. However, we can look at previous figures and trends to help us understand what MIGHT happen! 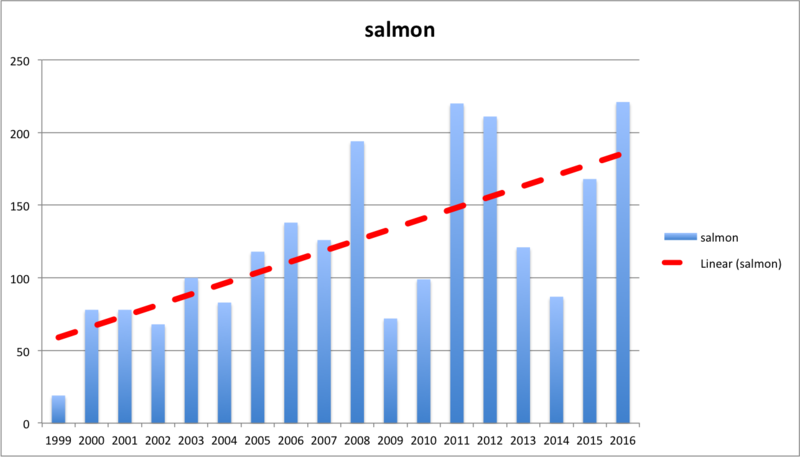 If I remove 2017 out the equation for now (will come back to that later), 2012 to 2016 shows an improving trend for MSW salmon, for both weight and numbers. 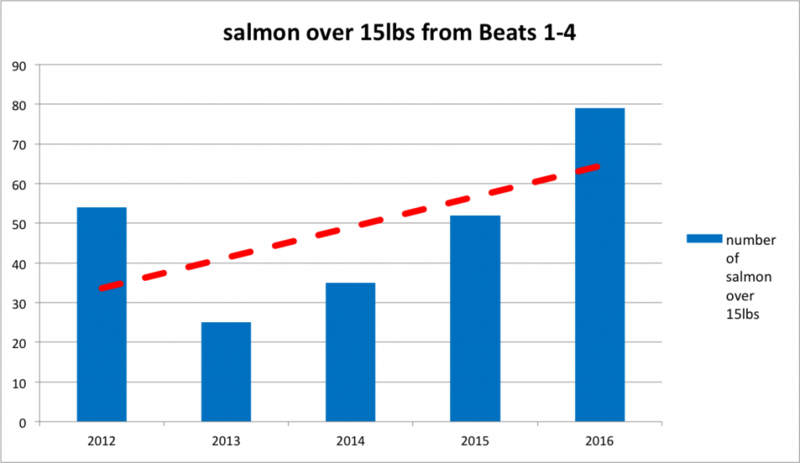 This statistic seems to confirm we are in the early stages of salmon cycle, linked with improved early season fishing and the downturn in the Autumn timeframe. 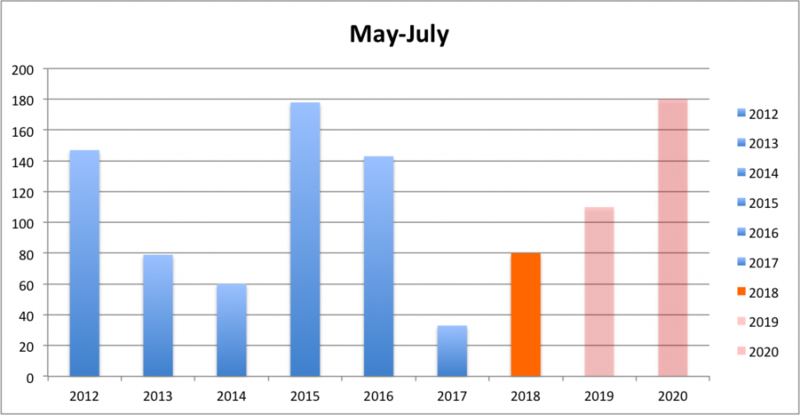 Of course within these cycles and changes, nothing is ever certain nor 100% predictable and stable, but we can clearly see an positive movement over the last 5 years in the May-July period. 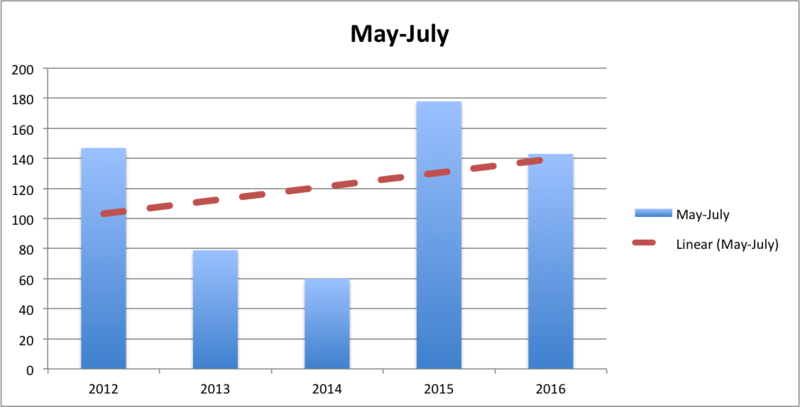 Even if we take a look back further the upward trend for MSW salmon is much more evident across the whole season. Its worth noting the sudden dips throughout this period but also the movement to higher peaks and higher troughs – showing a positive trend. In 2017, the MSW salmon run failed to materialise. It is fair to say this is a direct result of very poor smolt survival from the 2015 smolt run (e.g. Grilse numbers in 2016 were the lowest since 1998). These things happen! Like I stated above, salmon runs are far from predictable on a yearly basis and thus, even in an upward trend there can always be isolated years where a combination of factors create a collapse in numbers, hence it is better to focus on trends rather than one-off years. So, what does this mean for 2018? The Trend – MSW salmon survival at sea seems to be fairing better than the Grilse so there’s no reason to think that this trend won’t continue. Smolt survival from 2016 – The 2017 Grilse returns, although not spectacular, we’re an massive improvement on the 2016 numbers, leading to the conclusion that the survival rate was much better for these smolts than the 2015 smolt run. On this basis, the 2018 MSW salmon returns should be much improved also……. and will hopefully improve over the next 2-3 years. So, if we extrapolate some figures, the graph may look something like this? Looking further ahead, I would predict 2019 would see a further increase and then 2020 and 2021 could be back too much higher numbers. (peaks) This of course is my own speculative view but it is based on factual historical data trends. So, in amongst all the doom and gloom after such a bad season it’s good to reflect on what has gone before and relate it what may happen in the future. Food for thought anyway! ……And remember it’s always harder to secure good fishing when the peaks are at their highest!! With that in mind, I still have some excellent fishing available this spring/summer. See below. Some other split weeks available also. This could be the shortest fishing report I've ever done. Quite simply I have nothing to report catch-wise from the main Lochy beats. Despite fairly good conditions, no fresh fish entered the river! However on Saturday evening, ghillie John MacIsaac landed a nice female hen fish of around 24lbs from Mucomir pool.......probably a June fish! With no fresh fish and very few residents in the main beats the fishing is extremely challenging....and it's certainly a cause for concern looking ahead! It is without doubt that the run-timings of salmon are changing, and this is being seen across the country (not just west coast) with less and less fresh-run fish entering the rivers during the late Summer and Autumn period. Quite simply, we all may have to adjust our calendars and indeed our expectations to fit around these changes in the years ahead. I will be discussing this very matter with the RLA in the coming days. I am not predicting much of an upturn for the remaining weeks so the fishing will tough going! To have a chance of a fish, I'd fish the fly deep in the main holding pools with mornings and evenings being the optimum times.....conditions allowing! This could be the shortest fishing report I’ve ever done. Quite simply I have nothing to report catch-wise from the main Lochy beats. Despite fairly good conditions, no fresh fish entered the river! However on Saturday evening, ghillie John MacIsaac landed a nice female hen fish of around 24lbs from Mucomir pool…….probably a June fish! With no fresh fish and very few residents in the main beats the fishing is extremely challenging….and it’s certainly a cause for concern looking ahead! It is without doubt that the run-timings of salmon are changing, and this is being seen across the country (not just west coast) with less and less fresh-run fish entering the rivers during the late Summer and Autumn period. Quite simply, we all may have to adjust our calendars and indeed our expectations to fit around these changes in the years ahead. I will be discussing this very matter with the RLA in the coming days. I am not predicting much of an upturn for the remaining weeks so the fishing will tough going! To have a chance of a fish, I’d fish the fly deep in the main holding pools with mornings and evenings being the optimum times…..conditions allowing! 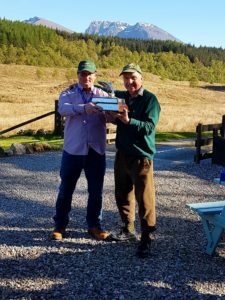 Malloch winner 2016-John Mac sharing his memories of the “Big Fish” day. Week Comm May 1st – The Good, The Bad and The Ridiculous…. Well, I’d love to start my weekly reports with photos of bright silver Lochy springers and happy fishermen, however I’m afraid it was the hillwalkers, golfers and tourists who were feeling much happier than the anglers this past week. The conditions were as poor as they could be – bright sun everyday, north east winds and low water……very frustrating for our opening week! Even when the sun dipped in the evenings, the air temp plummeted and was then colder than the water temp (55deg F) I can’t recall the first week in May with such low levels and cloudless skies!! Fish were seen at the start of the week, so we know they were there, but as the week progressed the conditions deteriorated and the fish disappeared. On a brighter note, the river is full of migrating smolts, more than I’ve seen for a very longtime, so lets hope we se some rain soon to get them flushed out. It was with great pleasure that we welcomed the team from Fishpal to present John MacIsaac (2016 Malloch Trophy winner) with this prestigious trophy. Tom Buchanan (winner in 2015) was kind enough to come up and present the trophy to John. John also won a Mackenzie DTX Rod, a box of flies from CaledoniaFly Company and £250 of Fishpal vouchers. Well done JMac!! 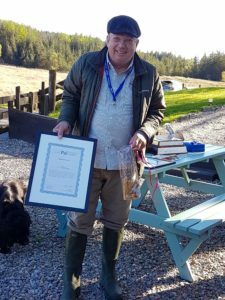 It was also great to see Lochy Ghillie Joe McGinty presented with his certificate in recognition of his efforts helping John successfully land, weigh and measure his magnificent fish. Well done Joe…good team effort! Here’s Anne Woodcock (Fishpal) and Tom Buchanan with John MacIsaac….and Joe with his certificate. 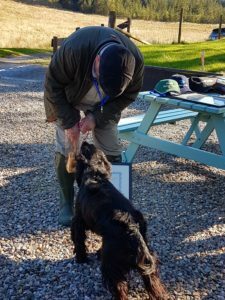 It was also nice to see Marshall (my black cocker) receiving his prize for assisting Joe and John on the day. Happy dog!! I’d just like to say a big thanks to Fishpal and Anne Woodcock for all their good work regarding this trophy and event. A big thanks to all those who donated prizes……Scott Mackenzie and Malcolm Anderson ….and a huge thanks who all those who attended and made John Mac’s day a special one. Now, back to fishing and prospects. The forecast is saying the wind is changing next week and we could get some cloud cover- this will be most welcome. The tides are building so I fully expect fish to run into the river, despite the low levels. Attention to tide times and fishing early morning and late evenings may provide the best chance. 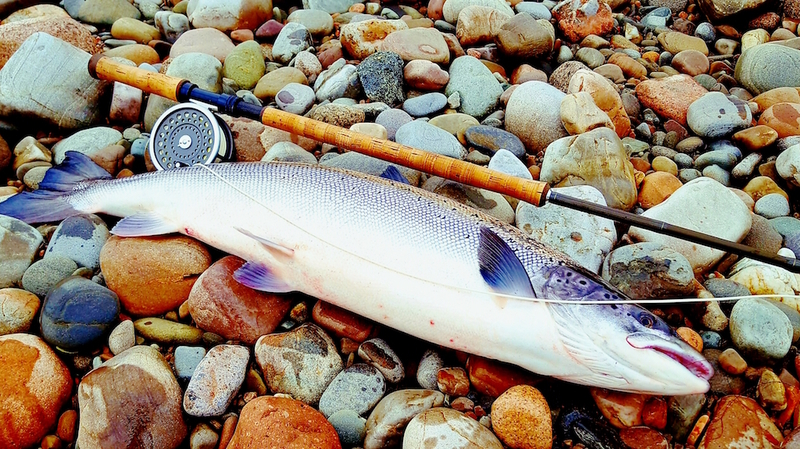 I still have some rods in June – primetime for big Lochy springers! John Veitch moves away from his role as River Manager to become the Sales and Marketing contractor under his own company. John will focus on promoting the river and securing a steady income stream through his online and media channels, his strong relationships with the RLA tenants and the sport Salmon Fishing industry at large. John’s value in this area is the key to sustaining and enhancing the RLA’s commitment to future investments on the River and in our Hatchery Operations. John will continue to manage all tenant relationships, bookings (incl ghillie arrangements), reporting and communications. In addition to the above role, John will also have seasonal responsibility for Fishery Protection and Predation Control. John will also retain responsibility for the RLA’s close relationships with our local fishing clubs. These clubs play very active part in our overall River Management Operations and are valued contributors to the rivers future success and sustainability. Jon Gibb will continue in his valuable role of Hatchery and Restoration Manager, supported by Pawel Fowsak. This work and Jon’s on-going relationships with his Hatchery partners are key to the future success of the River Lochy. These changes have given me the opportunity to create a new role – Fishing Co-ordinator. From the beginning of April 2017 Billy Neil has agreed to accept responsibility for this role. 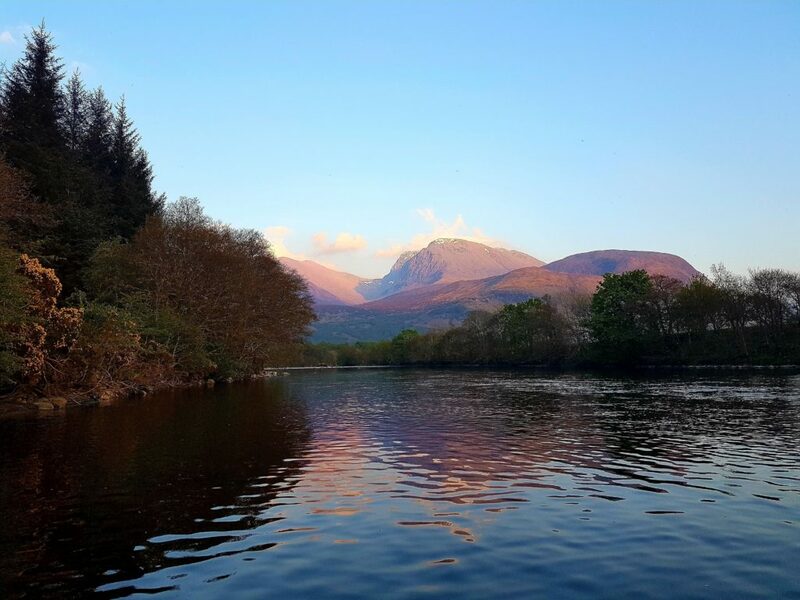 Billy has lived in Lochaber all his life and will be well known to many of you through his club memberships, fishing competitions and ghilling on the River. We are very fortunate that Billy has accepted this role. There are few people with the depth of knowledge that Billy has of all aspects of the River Lochy. Billy will be responsible for meeting and greeting fishing parties on a Monday morning, all aspects of bank, hut and boat maintenance, assisting John Veitch is predation control and coordinating daily catch data. As this is a new role on the river can I please ask you all to support Billy where you can and understand any bedding in issues we might experience.